"The outlook for the restaurant industry remained positive for the months ahead, as the Restaurant Performance Index (RPI) remained above 100 in May. The RPI – a monthly composite index that tracks the health of and outlook for the U.S. restaurant industry – stood at 101.4 in May, down 0.2 percent from April’s level of 101.6 (red line in chart). Despite the decline, May represented the seventh consecutive month that the RPI stood above 100, which signifies expansion in the index of key industry indicators. Restaurant operators reported positive same-store sales in May for the 12th consecutive month. 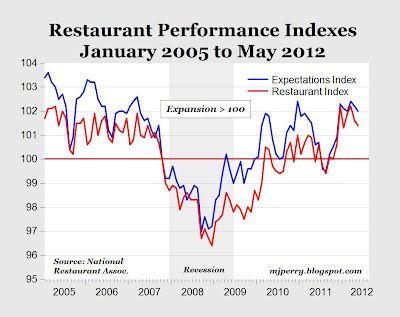 The Expectations Index, which measures restaurant operators’ six-month outlook for four industry indicators (same-store sales, employees, capital expenditures and business conditions), stood at 102.0 in May – down slightly from April’s level of 102.2 (blue line in chart). 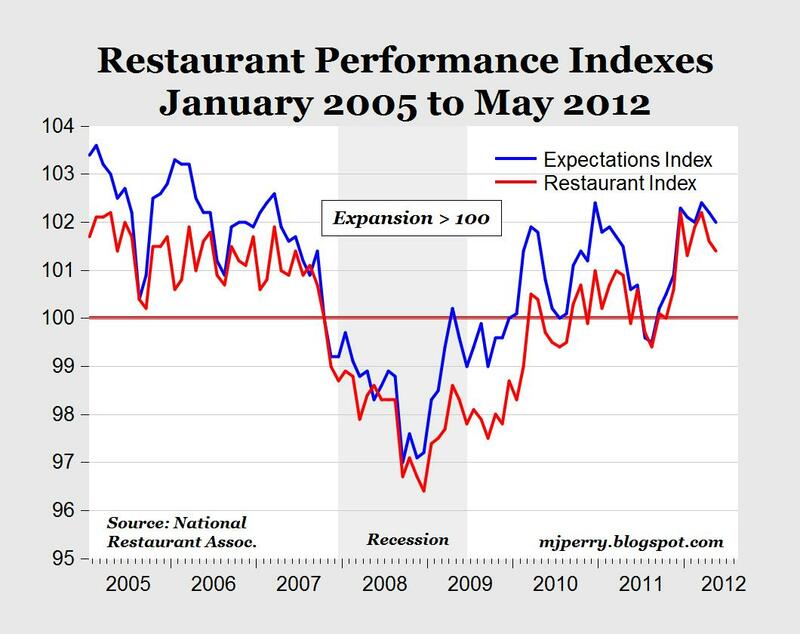 May represented the ninth consecutive month that the Expectations Index stood above 100, which signifies a positive outlook among restaurant operators for business conditions in the coming months." MP: The RPI has remained in a range between 101 and 102 for the last six months, and the Expectations Index has remained above 102 over that same period, which is consistent with the ranges and levels for those two indexes back in the pre-recession time frame in late 2006 and early 2007. This is an indication that the U.S. industry has made a full recovery from the recession and the industry's performance has returned to pre-recession levels. More evidence of an improving outlook for U.S. restaurants is provided by Census data showing that sales for "Food Services and Drinking Places" improved 7.4% in May from a year ago, following an annual increase of 8.5% in April. After being flat for most of 2008 and 2009, sales at "Food Services and Drinking Places" in May were running 17% above the June 2009 level when the recession officially ended. Further, sales at "Full Service Restaurants" were up by 8.7% year-over-year in April (data not yet available for May). All of the key data suggest that the restaurant industry has made a full recovery from the recession and is now operating back above pre-recession levels for inflation-adjusted sales. Regardless of how consumers answer confidence survey questions, the strong improvements in restaurant sales and the RPI in recent months would indicate that tracking actual consumers spending on restaurant meals is reflecting a high level of consumer confidence. The Google Trend for "restaurants" has been sharply up (2011 & 2012), after being flat quite a few years.